I am a sucker for pasta dishes... I crave pasta like a mad woman. It is a curse, I know this... I'm working on it. 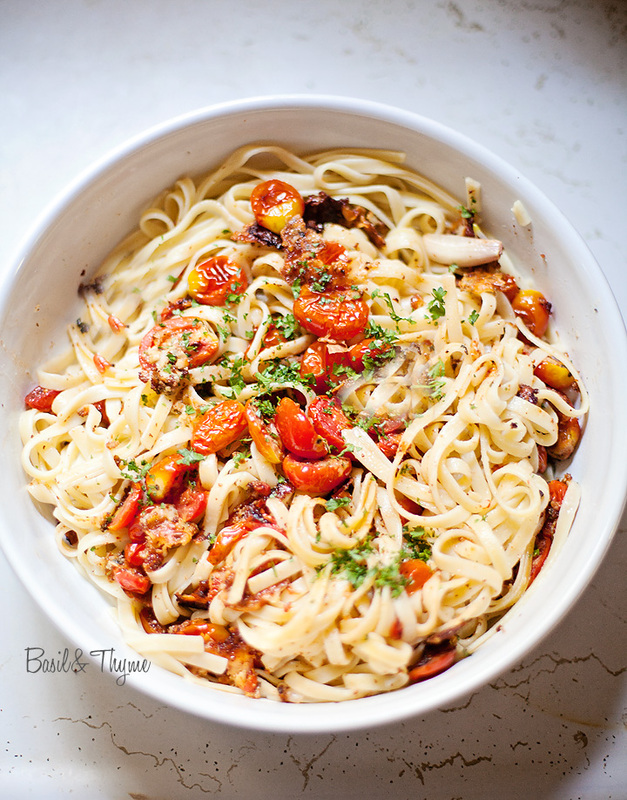 When I found this recipe for a roasted cherry tomato pasta dish, I could not pass it up. And on a hot summer evening, I needed a quick dinner dish to feed my hubby before he took my littlest to baseball practice. It was easy and so yummy. There was just enough left to leave me a decent lunch tomorrow. The herbs and cheese mixture... before the breadcrumbs were added. 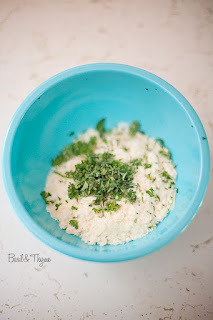 In a bowl toss the bread crumbs, cheese, herbs and garlic together with a fork. 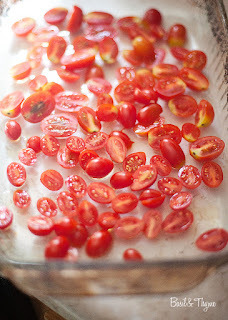 Sprinkle the tomatoes with one more tbsp of olive oil and salt and pepper. Sprinkle the cheese/bread crumb mixture over the tomatoes. Bake until the tomatoes are browned, around 20 minutes. In the mean time, boil your water for your pasta. Cook your pasta according to the package directions. When tomatoes are finished, remove from the oven. I tossed my pasta with a squirt of olive oil to keep it from sticking (after draining of course) and used one slab of a compound butter mixture I had on hand, it was a garlic herb butter. 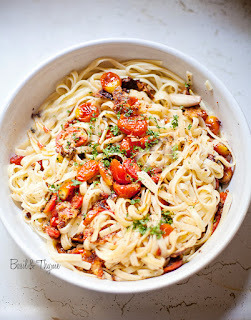 Mixed that in, tossed the pasta with the tomatoes, topped it with some fresh chopped parsley and served.